Before we became parents, many of us would have driven any type of vehicle without much thought as to whether it was equipped with properly functioning safety features. However, as soon as we secure our newborns in a car seat for the first time and drive away from the hospital, a safe ride is our number one priority. Car accidents claim the lives of thousands of drivers and victims each year for a variety of reasons from a reckless driver to issues related to automobile failure. “An auto part or system fails because of faulty manufacturing or design,” says Riddle & Brantley, Raleigh Car Accident Lawyers, “fatal or serious accidents have been attributed to a sudden tire blow-out or airbags that failed to deploy or deployed without warning.” Unfortunately, recently, a massive airbag recall has left many parents second guessing getting behind the wheel in fear that their next car trip will be their last. When any massive recall occurs, it’s natural to panic, but it’s also important to remember that recalls will force companies to be more accountable and hopefully create a safer product. In May of 2015, the Japanese company Takata, one of the biggest airbag suppliers for more than a decade, admitted that its airbags were defective. As a result, 34 million vehicles in the U.S. were recalled; that’s about 1 in 7 of the over 250 million vehicles on the roads. The airbags were deemed defective after exploded during deployment, sending shrapnel into the passenger compartment. The dangerous defect has been responsible for six deaths and over 100 injuries. With a recall like Takata’s, there are numerous makes and models of vehicles that can be affected in the recall. If your vehicle is equipped with a defective airbag, you should receive a notice to have the airbag replaced. Failure to resolve the issue can put you and your child’s life at risk. You shouldn’t wait for the next recall to ensure that your car is safe and reliable. If you are shopping for a new vehicle don’t forget to check out safety ratings before making your purchase. 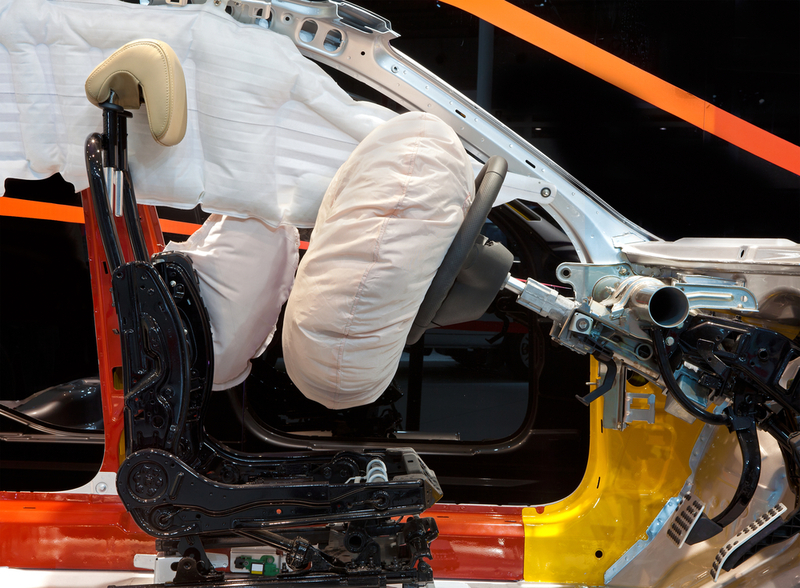 While a vehicle may malfunction at any time, it’s vital to make sure that your child has a safe and appropriately sized safety seat for his or her size; remember, safety seats and seat belts can prevent injuries leading to disabilities and even save lives. In order to keep tabs on the safety and reliability of your vehicle, pay attention to the news and check out vehicle safety sites, such as National Highway Traffic Safety Administration (NTSA). Additionally, find a car technician you trust and set up scheduled maintenances to check things like the tires and brakes on your vehicle. Taking a few extra steps before you get behind the wheel of your car, such as checking brake lights or tire pressure, will ensure that you and your children are safer on any car trip.